Simon’s Town is rich in history, character, atmosphere and warmth. Its neighbours are whales, penguins and seals with world heritage status bird life, fishing and the beauty of Table Mountain and Cape Point. This is where you’ll find Bertha’s restaurant firmly implanted in the history of the village. To the left William Anderson’s fishing shed (in the foreground of the photos) is where Bertha’s Restaurant is currently situated. 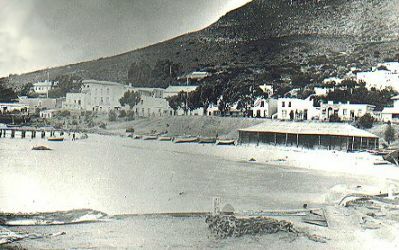 The photo depicts the view of Jubilee Square and Simon’s Town from the deep blue in 1880. 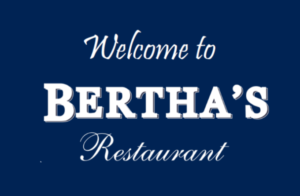 In 1993 a partnership was started by Tammy and Peter Weatmin, along with Rudy Minaar and Hugh van Zaan and resulted in the opening of Berthas Restaurant. Bertha’s was started in the old Simon’s Town Post Office Building which has since moved to above the Quayside Centre in Wharf Road. The original owners got the name from a ‘figurehead’ (carved woman on the prow of the ship), with influences from the Mississippi Jazz theme, the famous “Berthas” in Mississippi. It is now one of the most established destination Restaurants along the South Peninsula. Bertha’s has become a well-known stopping point in Simon’s Town, both with the locals as well as international travellers. 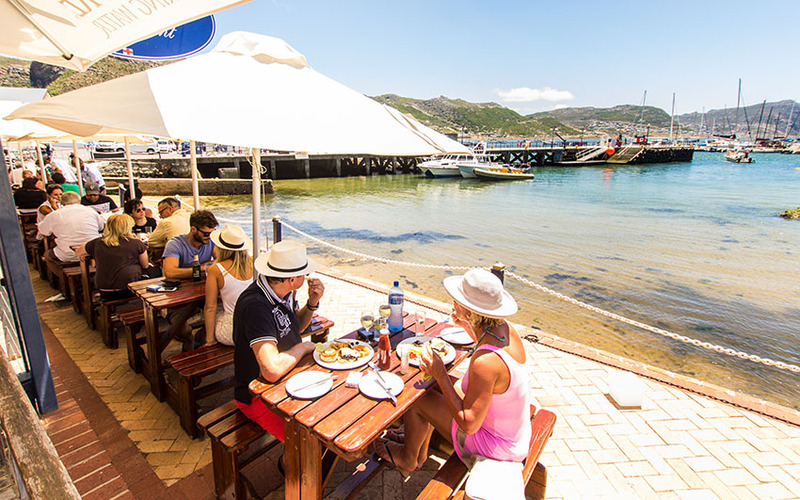 It is situated on the quay in Simonstown, with prime views of the Naval base, yacht club and False Bay, just off of the “Simon’s Town Historic Mile”. The Mile covers all the buildings along St George’s Street (the main road) from the railway station to the East Dockyard gates. Bertha’s affords guests spectacular views over the harbour and False Bay. Guests are able to take the train to Simons Town and then a leisurely 10 minute walk along the Historical mile to the Restaurant. The walk covers and captures the history of Simon’s Town from 1741 when the Dutch East India Company decided that Simon’s Bay would be their place for winter anchorage. From 1813-1957, Simon’s Town was home to the Royal Navy of the South Atlantic, and from 1957 to today, is home to the South African Navy. Fresh Seafood, Catch of the Day, Oysters, Prawns and our renowned Bertha’s Seafood Platters are some of our signature dishes. The Restaurant has a “nautical” feel to it, with Just Nuisance and photos from the Historical Society displayed on the walls.